The dedicated bikeway will connect the Belconnen Town Centre, the University of Canberra, Radford College and the Canberra Institute of Technology. Image: Supplied. The ACT Government has released plans to turn the now unused Belconnen busway into a cycle freeway as part of its construction of a dedicated bikeway in Belconnen. The 4.7 kilometres of new bikeway will upgrade cycle paths in and around the town centre by linking educational institutions to the east, and the former busway to the west. The dedicated bikeway will connect the Belconnen Town Centre, the University of Canberra, Radford College and the Canberra Institute of Technology’s Bruce campus. The bikeway will start on Coulter Drive in Florey and will continue along the old busway on Joynton Smith Drive to the Belconnen Town Centre. It then continues along Emu Bank through to the University of Canberra to Haydon Drive via College Street. Also included in the current program of works for active travel improvements in the Belconnen Town Centre is the Benjamin Way protected cycleway project and the Belconnen Arts Centre foreshore path. 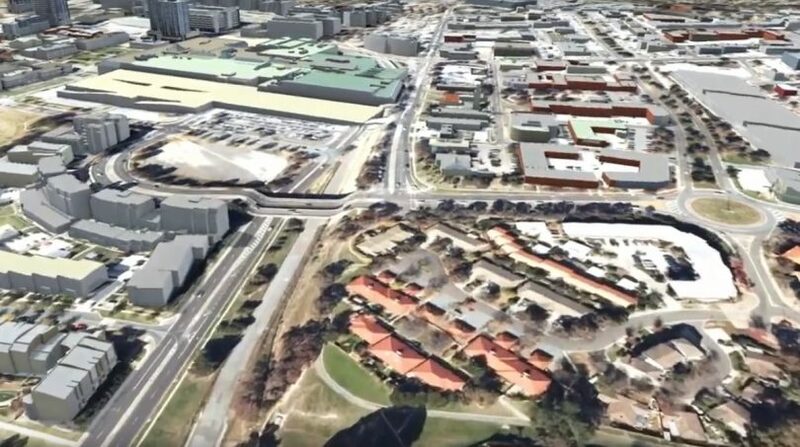 The design is expected to be finalised later in the coming months, with the 12-months of construction expected to begin midway through this year. ACT Minister for City Services Chris Steel said the new bikeway tender aims to deliver a network that makes it easier for people to get around the Belconnen Town Centre, providing better links to the surrounding suburbs. “This is a huge step forward for active travel in Canberra, with Belconnen Bikeway being the first separated cycle facility of its kind in the Canberra community path network, outside of the City cycleway,” he said. Following consultation with key stakeholders including Pedal Power, the Belconnen Community Council and the Heart Foundation, the proposed alignment was released for wider community consultation in the first half of 2018 and was funded in the 2018-19 Budget. Member for Ginninderra Tara Cheyne said she was thrilled that the Government was delivering on its commitment for a better connected Belconnen, as the bikeway approaches the construction phase. “This improved accessibility will make a real difference for commuters in Belco, as well as people who just like to get active on the weekend,” Ms Cheyne said. In late 2018 work began on the Belconnen Arts Centre building extension and the ACT Government is now preparing to deliver a shared path on the lakeshore that will connect the commercial precinct to the east of the Arts Centre with the public parkland at Emu Inlet to the north. This work will complete the missing link in the Lake Ginninderra foreshore path. Preliminary design is being finalised and the detailed design is expected to commence in the second half of 2019. For more information on the Belconnen Bikeway and other projects in the area, click here. I'm glad they're doing something to make Belco town centre easier to traverse for someone, because it is so much harder and slower by car since the new interchange went in. Traffic lights every 100 meters, all set to prioritise buses. The bikeway from West Belconnen/Florey that crosses under Totterdell Street etc just needs to be opened across the old busway to give access to the Lake and the bike path there. Cheaper than doing up the old busway and a more direct route to West Belconnen. I did suggest this route during the input/submissions period. The old bus lane included a crossover from driving on the left to driving on the right because platforms at Belconnen Interchange required access to the bus from the left of the bus. Tram stage 4 maybe to Charnwood/Hall – definitely shouldn’t derail the Belconnen Way tram line plans though. Its time to discuss bike-friendly monorail. Can’t they put a tram on it? The disused bus lane is less than a 1KM long by the looks of it. Is there a better explanation of the plans, I followed the link provided, but it was short on detail. I hope this is a real initiative, not just a quick fix to look like the government is doing something. I think the latter. All well having it as a bike path but one end is coulter drive so needs to connect to something and the other end is the shopping centre carpark. But will they use it or still ride on the roads now like they do all over. They'll probably use the roads to get to it. Looks great. This is also a likely route for the tram, wonder how this affects that with the amount of room on either side of these roads.